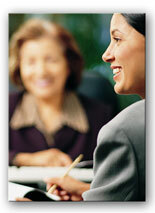 ProDoc's software applications are designed to serve the busy, legal professional. Unfortunately, the busy, legal professional's own worst enemy is a lack of time. We recognize this, which is why we work so hard to help you "recover" as much time as possible by training you and your staff to get the most from ProDoc software. Invest the time — Save the time! Our computer-based training (CBT) is only a mouse-click away. Explore the features of ProDoc right in your computer's internet browser with these easy to use presentations. Watch the presentation and then try it yourself. Come back frequently. We recently added an eFiling tutorial and will soon add other helpful topics. Thomson West® provides web-based training covering specific ProDoc products. You will see only currently scheduled training sessions. Check back frequently to see new and different topic offerings as they are scheduled. Based on availability, we'll schedule you for up to a 50-minute training session on a ProDoc application topic of your choice. Additional telephone training sessions may be requested. Generally, the complete, basic ProDoc training course is a prerequisite for all other topics such as Small Office Suite (SOS), PowerPacks, or advanced ProDoc topics. Call 800-328-0109 or email west.iamadmin@thomson.com to schedule your telephone-based training.